#1 – Writing from the reader’s point-of-view, being focused, and relevant with my writing. I overcame this by looking at other articles on other sites such as BNET, Wall Street Journal, and others – reading headlines that grab my attention and then [writing] my own article titles and ideas to be provocative for the reader. Also, working with a coach has helped me come up with article ideas and focus. #2 – Marketing articles to get readers other than my web visitors. EzineArticles has been great for this. I have an email list of about 3000 and by submitting my articles to EzineArticles, I have expanded the readership. Also, many clients are impressed when I send them a link to [my] EzineArticles.com [articles], as it shows the amount of writing I do and it is a reliable source for content. 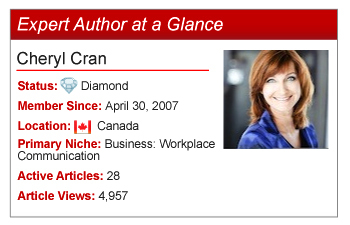 I am working on increasing my readership by publishing articles in a variety of industry websites. #3 – Getting my articles on other sites such as leadership sites, leadership blogs, etc. I find that I have not made as much of a focused effort on getting my articles on industry sites, but this is definitely a focus for 2012 and beyond. I plan to spend some focused time on getting articles placed in industry magazines and online blogs to increase my profile in my area of expertise. Try Cheryl’s strategies to overcome your own article writing and marketing challenges for your next set of quality, original articles. Do you have a question or comment for Cheryl? Feel free to leave it in the comments section below. I have no problem with Cheryl’s thoughts about collaboration, innovation, and leading change as very important peices of addressing leadership responsibilities, but there needs to be a more concentrated effort in creating a larger “Leadership Pool”. A leading change efort that a focuses on addressing “Transformational Leadership” directed at the newly developing discipline of “Folowership” gives a much greater opportunity for addressing real collaboration. This whole process needs to be directed toward society a a whole, which is really where our leaders come from. Hi Cheryl, congrats on the great publicity, and the awesome work that you’re doing on EzineArticles. I think your research on reading articles on BNET, Wall Street Journal, and others is a good tactic for coming up for inspirations for your own article content. This is something that I have just started to do myself. Once again, congrats on the spotlight, and I wish you much success. I Love It! Working from your home office with a view of the lake sounds wonderful! In other words, living the dream! Way to go! You are so right. I think it is important to put some of your articles on your own industry sites. That enhances your expertise in the eyes of the readers. Hi Cheryl, thanks a lot for sharing your experience of article writing with us. Whatever you have described in this post is quite worthy for us. Thanks to Penny as well who added great flavors onto it. Although I have a profile that I’ve been using I am very un happy with it. I believe it could be written much better.I was searching for a template in Ezine to give me sort of a guideline. Do you have any suggestions?